Scottish Oatcake Oatmeal Pancakes are so much better than boring old pancakes, any day, and are super simple to make. Just mix up oats and buttermilk the night before and finish them in the a.m.
To tell the truth, I’ve never really been much of a pancake fan. I was actually lucky to have spent some time with my folks in the last few years so I could up my pancake game (See my menu for Breakfast and Brunch) because they love any pancakes. 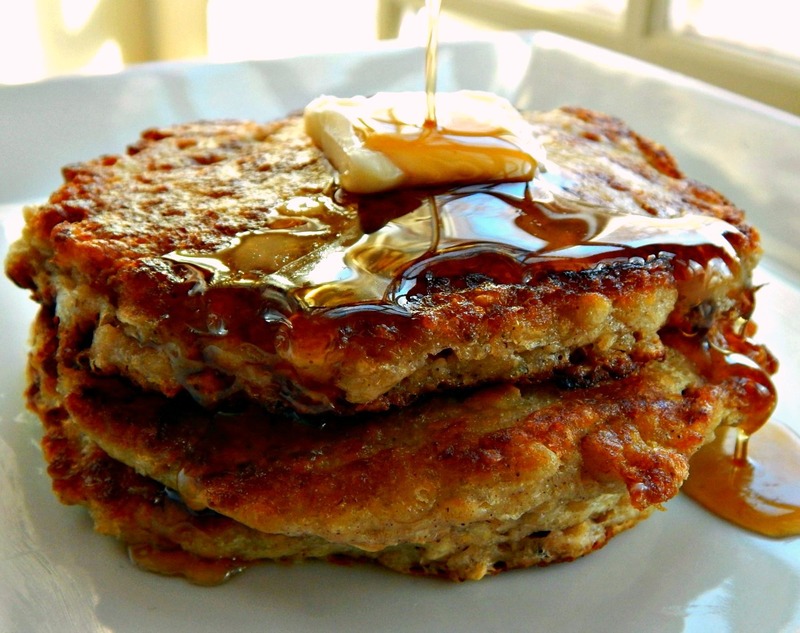 But what they loved and I love are these Scottish Oatcakes Oatmeal Pancakes. I’ve been making Scottish Oatcakes Oatmeal Pancakes since I was just a kid – I was such a vegetarian and such an idealist! These pancakes became a staple in my house and have been for almost 40 years. I love that they’re oh so tasty and so healthy, too. Here’s what the World’s Healthiest Foods has to say about Oatmeal. And since I’m not a morning person, I love that they’re pretty much made ahead. Dress your Scottish Oatcakes Oatmeal Pancakes any way you’d like, They’re actually really good, just plain with nothing on them. My fave way to eat them is with jam. A little raspberry or blackberry, or just about any jam is great on these. And of course, like any pancake, you can’t go wrong with butter and/or maple syrup. These Scottish Oatcakes Oatmeal Pancakes are sturdy enough to grab one on the go, too, if your kids are like mine were – running out the door last-minute for the school bus. To make things super easy in the morning, mix up your oatmeal and buttermilk and put it in the fridge, with the eggs sitting right on top of the covered container. Mix up the dry ingredients and put out on the counter. Then when morning comes you can practically make these pancakes in your sleep. Everything will be right at reach in the am. If you don’t have buttermilk, just use the old trick of adding a tablespoon of vinegar per cup to the bottom of your measuring cup, then filling with the milk and letting it set for a few minutes to clabber. I seldom have buttermilk, and when I do am always hard pressed to use it and hate the hassle of freezing it. Besides your own homemade “buttermilk” is much cheaper than purchasing actual buttermilk. My favorite way to make these is plain, with just a bit of cinnamon or apple pie spice, but in the fall, you can’t go wrong with Pumpkin Pie Spice. A have a trio of Pumpkin Pie Spice recipes to choose from. If you’d like raisins or any chopped dried fruit are great in Scottish Oatcake Oatmeal Pancakes, too. If you’re looking for more inspiration, think of any way you like your oatmeal and mimic those flavors in these pancakes. Watch for oats to be at a low when they’re in season, which is generally in the fall. If you’re buying Quaker or any brand name, watch for coupons along with the sales and stock up. Aldi and Costco both have great prices on oats, and the Aldi brand, to me, is indistinguishable from Quaker. If there are any leftover pancakes, just lay out on a plastic or parchment lined sheet tray, freeze, and when frozen gang them up in a Ziploc. Reheat in the microwave. Soak oats in buttermilk, overnight, in the refrigerator. In the morning, in a separate bowl, mix eggs, then add butter and raisins or dried fruit. Add to the oatmeal mixture and stir gently. Mix together the dry ingredients in a small bowl, the flour, baking soda & powder, cinnamon, and salt. Add to the oatmeal mixture and stir until just moistened. 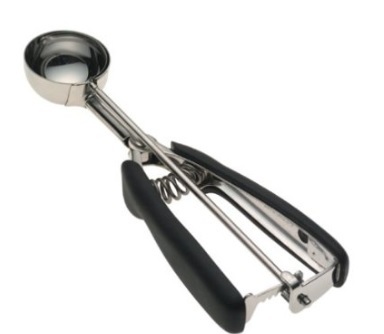 Spoon 1/3 cup onto an oiled griddle or pan, spreading a bit with a spoon or spatula, if needed. Cook until one side is well browned, then turn and finish cooking on the other side. Depending on the length of soak and type of oats, the consistency of this mixture may be a bit thick. If it is too thick to easily spread, add a bit more buttermilk. These freeze beautifully: cook, lay out on a lined baking sheet. Freeze until hard and stack in a Ziploc bag. Once the basic recipe is down, the variations are almost endless. I don’t typically make these with fresh fruit, but why not? The cinnamon is very subtle and could be increased, and these could be flavored, as well with other spices. If you’re avoiding flour, a substitute could be made for the 1/2 cup. This entry was posted in Click here for Bargain Meals, Click here for Fabulous Food Posts and tagged Bargain Meal of the Week, Breakfast or Brunch Dish, Buttermilk, Family Recipe, Freezes Well, Oatmeal, pancakes, planned leftovers, Scottish. Bookmark the permalink. OMG – what a wonderful oatmeal recipe. Definitely making this. These are my favorite pancakes – for decades it was the only pancake I would eat! I will try this recipe. They look great! The picture sold me. I was thinking about oatmeal pancakes. This recipe is perfect for me. These look tasty but the name is definitely not right – a Scottish oatcake is a type of crisp cracker made of oatmeal. “Oatmeal pancakes” is a fair description of what you have here. Made these this morning and they were AMAZING! I have to use GF flour and the two cups it usually calls for is a lot when the flour is so expensive (we live in Paris so it’s harder to find as well). But gf oats are much cheaper, so that saves A LOT of money. They also came out way fluffier than my usual gf pancakes. I’ve been unhappy with all the gf pancake recipes I’ve tried for the last 5 years. This is the first one going in the recipe box and will be my new go to. Well, you just made my day!! I’m glad you liked them, and I think they’re a little healthier than your standard pancake, too! I appreciate you stopping by to let me know, Rachel! I have made these several times adding different fruits and nuts…have now settled on my favorite combo..dried cherries with pecans..I make them on the weekend,freeze half, take one along with a container of yogurt for breakfast…..an awesome recipe ! Hi Meg, thanks so much for stopping by and commenting! Are your co-workers jealous? I think that combo sounds amazing. I love dried cherries and pecans! I’m going to have to make them that way next time. Have a wonderful weekend. Wonderful! 🙂 I’ll check it out right away, and thanks. I love hearing about and passing on interesting tidbits about recipes! I see a new post coming up with St. Bridget Oatcakes! I’m going to try this. Looks great! I had a wee bit of an inkling they were a “fake” Scottish food, lol! They still sound and look really delish! We had these for breakfast this morning and thoroughly enjoyed them. Theye were nice and soft for my ten month old to gum on. I soaked the oats in a thin yogurt as that’s what we had on hand, but I don’t think that would have made a difference from the original recipe. Meets my three criteria for a meal: Filling, nutritious and cheap! I can attest to the fact that substituting another type of flour to make these gluten free works well. I did a half and half mixture of oat flour and oat bran. Love the texture of these oatcakes! Thanks, Dianna! It’s great to have the feedback. I just pulse up oats in the food processor for a few different recipes and it always seems to work well. I bet the bran adds a bit, too, to the texture. I looooove these pancakes! I’ll definitely give them a try soon. They look so divine. Healthy/delicious…yum! Thanks alot! P.S. Thank you for checking out my post. It’s always great to see you. I love that nutty flavor! Next time. So funny in all these years I’ve been making these I haven’t done that yet. 🙂 Thanks for stopping by and dropping the comment. Another recipe I am going to try this weekend! I always have oatmeal in stock. In any case, these were fantastic; super filling and carried me right through to lunch. I liked that they are sugar-free too. Oh my gosh, I’m so flattered! 🙂 Tell your friend thanks, and feel free to comment back with your site so the url is here! I’d love to visit! 🙂 I imagine these could pretty easily be made Vegan, too. I know they’re easy to make gluten free just by grinding up some oats in the food processor to use instead of flour.